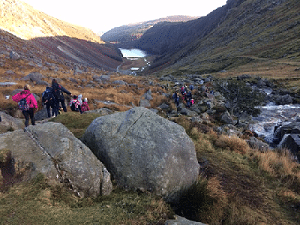 The Transition Year Hillwalking module continued on the 8th Dec. with a walk in the Wicklow Mts. This follows on from earlier excursions to the Sieve Blooms and Achill and involved a climb on Spink mountain in Glendalough. The weather gods certainly shone on the students, Mr. Roe and Mr.Fogarty as a warm December sun beamed down. In addition the group was led by Cathal MacNicholas, an experienced Hillwalking guide and leader who showed the students the basics of map-reading using GPS and Compass. After a tough but enjoyable walk of 11km a tired but satisfied group returned to base. Another challenge faced and conquered!!! This entry was posted in Sports & Activities News and tagged Transition Year.